After the failure of two Senate Bills to expand background checks and keep guns out of the hands of suspected terrorists on Monday, members of the House have taken to the floor of the House floor and have staged a literal sit-in until House Republicans say they will vote on gun control measures. Georgia Representative John Lewis lead the charge demanding a vote on gun control. “No bill no break,” is the phrase being shouted by House Democrats, as they demand Paul Ryan to keep the House in session so they could come up with their own bill. Ryan told CNN that this is nothing but a publicity stunt and that he wants a bill written in a “calm and cool manner” that doesn’t infringe on 2nd amendment rights. 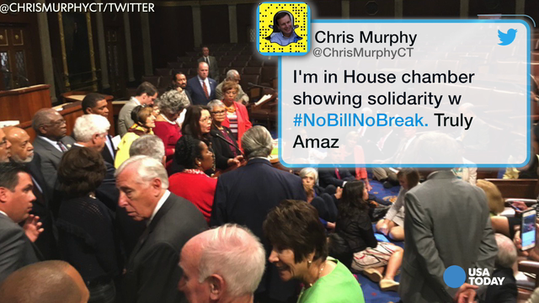 Because the House isn’t in session, cameras have been turned off. The House Members are keeping the public informed with their social media accounts and using Facebook’s new “Facebook Live” tool. This event is still ongoing and we’ll be seeing the results in the near future.